Live, Love, Laugh and RENOVATE! : LOVE IT TUESDAYS! ITS A LOVE IT TUESDAY! I plan every Tuesday (hopefully... as long as I'm not swamped) to post links of projects that I would LOVE to try out... and I may just eventually try them out too!! 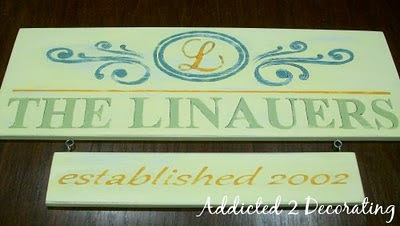 This weeks LOVE IT project I found on one of the blogs I follow periodically, Addicted to Decorating. It is a handmade antique looking family sign. You can find the tutorial on how it was created here. I love this idea for many reasons... the biggest reason is that maybe if I can make one of these successfully I can get rid of the 1970's made 'The Guerin's" sign that Ryan refuses to get rid of and is hanging in my back hallway.... IT HAS CARTOON BUNNIES ON IT!!!!!! No matter how many places I hide it, it just keeps coming back! SO if I can successfully make a new one maybe just maybe we can get rid of the bunnies!!!! WISH ME LUCK!!! I will post how it turns out when I get around to it... even if my attempt looks AWFUL I'll still post it!